Comments: The greatest Star Wars battles are at your fingertips! The Deluxe Battle Packs Unleashed series captures the raw emotions of each hero, villain, soldier, and commander as they operate their vehicles and high-powered weaponry in the heat of battle. Collect all of these awesome miniature-scaled sculpture sets to re-create the excitement of each epic battle, and may the Force Be with You! The Rebel Alliance is facing one of its darkest hours. With Imperial AT-AT walkers and several legions of snowtroopers moving to attack the Rebel’s Echo Base on the ice planet Hoth, a group of Rebel Troopers dig into snow trenches and prepare their laser cannons and blasters for battle. Using anti-infantry laser batteries, the Rebels create a rapid spray assault aimed at disabling enemy ground troops. 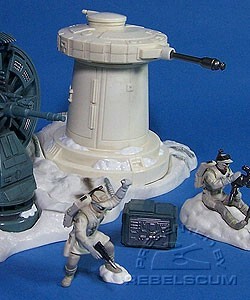 All anti-vehicle laser cannons focus on weakening the mammoth AT-AT walker legs. The Rebels put up a good fight, but the AT-AT armor is extremely thick and virtually impenetrable by laser fire. Ultimately, the Rebels are overmatched by the Imperials, but are successful in allowing several transports carrying crew and supplies to escape. The Rotating Anti-Infantry Laser Battery clicks and pushes forward when it is turned. The Snow Bases actually can be displayed in 3 different layouts.